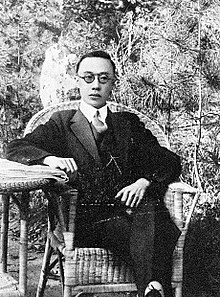 Puyi (Wade-Giles: Pu-i; 7 Februar 1906 – 17 October 1967), o the Manchu Aisin Gioro clan, wis the last Emperor o Cheenae an the twelft an final ruler o the Qing Dynasty. Still a bairn, he ruled as the Xuantong Emperor (Wade-Giles: Hsuan-tung Emperor) frae 1908 til his abdication on 12 Februar 1912, efter the successfu Xinhai Revolution. Frae 1 tae 12 Julie 1917 he wis briefly restored tae the throne as a nominal emperor bi the warlord Zhang Xun. In 1934 he wis declared the Kangde Emperor (Wade-Giles: Kang-te Emperor) o the puppet state o Manchukuo bi the Empire o Japan, an he ruled til the end o the Seicont Sino-Japanese War in 1945. Efter the Fowkrepublic o Cheenae wis established in 1949, Puyi wis imprisoned as a war criminal for 10 years, wrote his memoirs, an acame a member o the Cheenese Fowk's Poleetical Consultative Conference. Puyi's abdication in 1912 merked the end o millennia o dynastic rule in Cheenae an sicweys he is kent throughout the warld bi the sobriquet "The Last Emperor" o Cheenae. Wikimedia Commons haes media relatit tae Pu Yi. "Five Wives of The Last Emperor Puyi". Cultural China. Retrieved 9 August 2010. This page wis last eeditit on 16 November 2018, at 08:19.